This year we are entering our second official year of homeschooling for Isabella which is 3rd grade. We decided to share what we will be using for the year with you! There is a video below where you can actually see everything that I will be talking about here. I may also mention other things that I had forgotten to mention in the video. 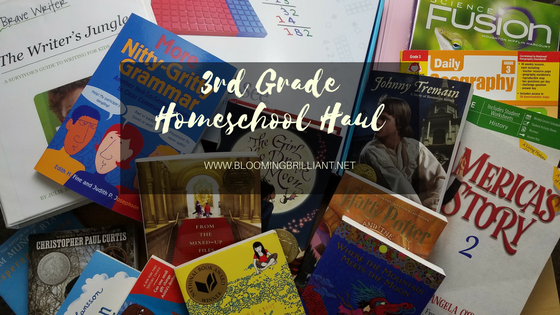 Let’s get started with our 3rd Grade Homeschool Haul! This year we changed our math curriculum. While we loved our curriculum last year, Isabella asked for something that she could enjoy more. As a child, and even now in adulthood, math gives me hives! I am capable of doing it and I have faith that I can enjoy it at some point but because of my bad experiences in my youth, I wanted a program that will give me support as we enter into more challenging work. That is why we chose to use Math U See this year. It looks like a really amazing curriculum, that we are extremely excited to start. I love how it has lessons on DVD and it has an instruction manual, plenty of support for me and my children. The student workbook looks really good and looks like it includes some fun stuff as well. There is a testing book which, I think I will find useful to keep track of her progress for quarterly reports and annual assessments. The kids are super excited to use their manipulatives, which I can not lie, they look pretty awesome. Math U See also has more manipulatives such as algebra inserts and fraction overlays. Another great feature Math U See has is their app which I haven’t downloaded yet but it looks pretty good from the information I have seen when researching the product. I like the ability to “take” the manipulatives on the go through the app. As a homeschooler, you know that you are not always home when you are doing school so the ability to keep math fun even while on the go is a win! I also purchased the Skip Counting and Addition Facts Song Book and CD set because it looked super fun for both kids. We actually opened this up the day I recorded the video and used it and it was so good! We plan to have a Math Sing along and Coloring Party. 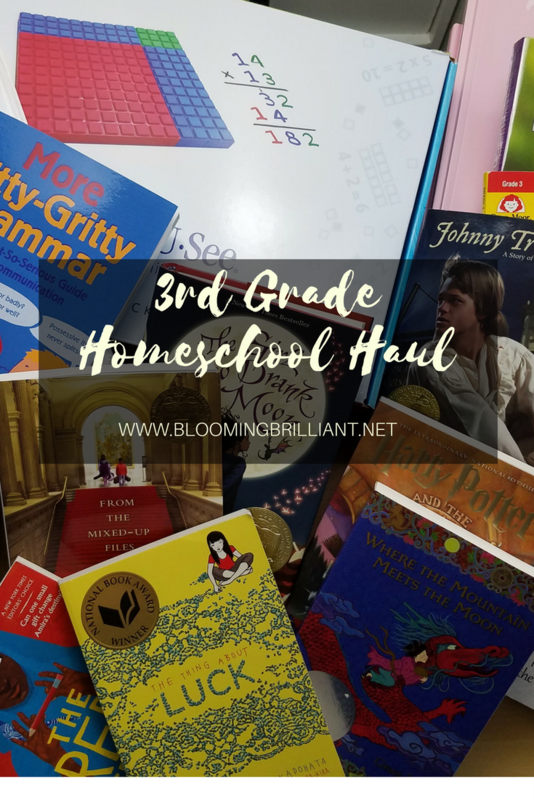 We also plan to start reading Harry Potter and the Sorcerer’s Stone by J.K Rowling using the unit study Amy Milicic from ‘Rock Your Homeschool’ mentioned last year. Now, I didn’t mention vocabulary in the video but I did mention it in my Plan with me: Filling out the Individualized Home Instruction Plan (IHIP) video. For vocabulary this year we will be taking words from the books we are reading and our curriculum texts and focus on that. There is not separate Vocabulary Curriculum we will be using. We are just writing down words in our notebook that she doesn’t know and we are looking them up, writing the definition and then studying them. If they come from a story then we study them until we are done with the story. If they come from a unit in a text we study them until we are done with that unit. This year for English and writing we will be using the Arrow from Brave Writer here and we will be using The Writer’s Jungle by Julie Bogart another amazing addition from Brave Writer. I have been going through The Writer’s Jungle, but haven’t really started implementing anything yet. We are focusing on getting used to the Arrow and then we will slowly introduce more and more from The Writer’s Jungle and I go through it. This year for history we will be focusing on US History again and plan to continue using the same curriculum that we used last year, just the updated version. We will be using Angela O’Dell’s America’s Story Volume 2. We loved the first volume, it is an engaging textbook that tells students about historical events in story form. We loved the Student Journal and narration breaks and copy work. This is a very Charlotte Mason type of curriculum. We really enjoyed it and will continue to use it. This year for geography we will be focusing on the United States again this year but we will be starting to explore the world. So far all we will be using is Daily Geography Practice Grade 3. We really loved it last year, especially how it teaches you how to read a map and use the tools found on a map. It is a super simple workbook to go through but it still teaches a lot. We hope that it continues to grow with us as we learn more and more. We will be using supplemental books, however, we have not picked them out. Last year we did a couple of Geography parties, which were super fun and the kids learned so much. I plan to do more of those. We also plan to learn more about world geography as we take a more in-depth look at artists in our art lessons. This year for science we will be using Science Fusion again! We loved Science Fusion, it is a fairly simple and easy to understand textbook with bright colors that really does grab your child’s attention. We also love the virtual labs and the countless additional resources on their subscription-based website which comes with your book. As I state in the video, there are so many amazing resources that Science Fusion gives through their subscription which includes a digital copy of the book, a digital copy of the teachers guide, leveled readers, health activity book, vocabulary cards, biographies about amazing people in science, powerpoint presentations, tests, and even more. You really do need to take some time and explore the website when you purchase this curriculum, it is so worth it. This year we are focusing on the Systems of the Human body and healthy living. We will experiment with food and cooking. We will be using supplemental materials such as books, and videos. We will also be taking advantage of the Health Activity Book from Science Fusion. Physical Education is super important and I try to make sure that the kids are active every day. We will exercise as a family. We have a really old Nintendo Wii console, which we use to play Zumba, Zumba Kids, and The Biggest Loser. If we don’t do that we do basic exercises like jumping jacks, planks, pushups, situps, etc. The kids will also be in soccer again this year. For music this year we will be continuing with Soft Mozart which we adore and have used since Isabella was 2 years old. We will be studying piano. Musical notation, composers etc. Soft Mozart is an amazing program which mixes the fun of computer games and learning how to play the piano. It is extremely easy and fun to use. There are multiple games to play as well as a super supportive online community. They also provide lesson plans for the year. This year for art we are going to be studying many artists. We will be using Mixing with the Masters, Volume One by Alisha Gratehouse. This is such a magical curriculum because you have lifetime access to it, it is an ecourse so you can go through it at your own pace. We love how there are videos and readings as well as art to create. It is such a great resource. We will also be using curriculum sets by Art History Kids. They have a bundle of sets based on artists that really excited us over the summer and made learning about art so much fun. We are continuing to learn cursive handwriting this year. We love Fundanoodle and their I Can Write Cursive! book, it is perfect for both left handed and right handed learners. It teaches the formation of letters in a fun and engaging way, it is filled with trivia and fun exercises. You can check out a full review here. This year we are continuing our learning of foreign language through Rosetta Stone. We have been using it for a while and it is really a fun way for Isabella to learn to speak, write and read in another language. We study both Italian and Spanish. I am not going to go too deep into how we are going to do and use all of these materials, because I may be posting more planning videos and posts here on the blog. However, I can see how all these books and topics can look overwhelming. For us, we have a routine for the most part. We have certain subjects that MUST get covered on certain days, we do certain things that are considered fun like art, sometimes during “non-school hours”. Homeschooling is about freedom. Freedom to an education that is tailored to your child, focus on their passions. Don’t overthink it and take one step at a time. If you would like some more homeschool support, join our Homeschooling Support group on Facebook. Did you enjoy this post? Did you find it helpful? Do you currently use any of these curricula? If you do, feel free to share your thoughts in the comments. Did this help you choose a certain curriculum? Let me know in the comments below, we love hearing from you.